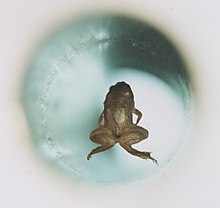 A live frog is magnetically levitatit, an experiment that earned Sir Andre Geim frae the Varsity o Nijmegen an Sir Michael Berry frae Varsity o Bristol the 2000 Ig Nobel Prize in pheesics. Geim went on tae win the Nobel Prize in Pheesics in 2010 for his wirk on graphene. The Ig Nobel Prizes are parodies o the Nobel Prizes gien oot each hairst for 10 unuisual or trivial achievements in scienteefic research. Thay hae been awairdit syne 1991, wi the statit aim tae "honour achievements that first mak fowk lauch, an then mak them think". The awairds can be veiled criticism or satire, but are an aa uised tae pynt oot that even absurd-soondin avenues o research can yield uisefu knawledge. This page wis last eeditit on 19 September 2016, at 00:37.